1928-29 Front fender spare tyre carrier brackets. Right or left. Both sides use the same brackets. This is the brackets for installing a spare wheel in the left front wing on the 1930-31 cars. The brackets for installing a spare wheel in the right front wing on the 1930-31 cars. Set of two 5/8-18 castle nuts, 2 cotter pins and 1 flat washer for the spare wheel side mount arm, on the Model A Ford. Spare Tyre Carrier in cast aluminium for the 1928-29 Coupe, Roadster and Cabriolet. Made in the USA. Spare Tyre Carrier in cast aluminium for the 1930-31 Coupe, Roadster and Cabriolet. Made in the USA. Spare Tyre Carrier in cast aluminium for the 1928-31 Tudor sedan, Phaeton and some 4-doors. Made in the USA. Spare Tyre Carrier mount Kit for the Coupe/Roadsters. All the hardware needed to mount the rear spare tyre mount to the body. Made in the USA. Spare Tyre Carrier mount Kit for the Sedans. All the hardware needed to mount the rear spare tyre mount to the body. Made in the USA. Spare Tyre Cover for the 1928-29. 21"wheel in Black. We have a big selection of these naugahyde tyre covers. These covers are easy to clean and have the Ford logo silk screened on. They have a draw string on the back side to give them a nice fit. Spare Tyre Cover for the 1928-29. 21"wheel in Tan. These covers are easy to clean and have the Ford logo silk screened on. They have a draw string on the back side to give them a nice fit. Spare Tyre Cover for the 1928-29. 21"wheel in White. These covers are easy to clean and have the Ford logo silk screened on. They have a draw string on the back side to give them a nice fit. Spare Tyre Cover for the 1930-31 19" wheel in Black. These covers are easy to clean and have the Ford logo silk screened on. They have a draw string on the back side to give them a nice fit. Spare Tyre Cover for the 1930-31 19" wheel in Tan. These covers are easy to clean and have the Ford logo silk screened on. They have a draw string on the back side to give them a nice fit. We also have a 20" cover available now which actually fits the 19" Firestone tyres. Spare Tyre Cover for the 1930-31 19" wheel in White. These covers are easy to clean and have the Ford logo silk screened on. They have a draw string on the back side to give them a nice fit. 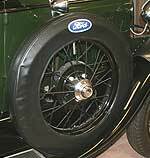 20" Spare Tyre Cover for the 1930-31 19" wheel in Black. These covers are easy to clean and have the Ford logo silk screened on. They have a draw string on the back side to give them a nice fit. We have this 20" cover available now which actually fits the 19" Firestone tyres. 1930-31 Tyre Support bracket which goes behind the panel below the deck lid and gives support for bolting the rear mount spare tyre on the body. Can be shortened to work on the 1928-29's. Made in USA. 1930-31 Spare Tyre support for the Coupes and Roadsters with a rear mounted spare tire. This bracket follows the contour of the curved inner panel, and the top bolt on the carrier goes through the hole in the end. Only for cars with deck lids hinged for rumble seats. Fender mount spare tyre plate only for the 1928-29 cars. If you have already got the fender mounted spare tyre arm, all you need is this plate. Fender mount spare tyre plate only 1930-31 Left. If you have already got the fender mounted spare tyre arm, all you need is this plate. Fender mount spare tyre plate only 1930-31 Right. If you have already got the fender mounted spare tyre arm, all you need is this plate. Side mount bracket bolts set 1928-29. Set of bolts and castle nuts to mount the 1928-29 side mount spare tyre bracket to the frame. Made in USA. The 1930-31 side mount bracket was originally riveted to the frame rail. One set per side. 3-5/16 D. X 1" Lg. Round Head Rivets. 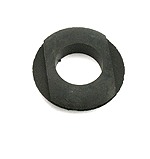 1928-34 Side mount spare wheel grommet. This special grommet fits in the splash shield to fill the hole between the spare tyre arm and the shield. Steel Fender Well for the side mount spare tyre on the 1928-29 cars. these are the wells that require welding to the fender. Made of good heavy steel. Good step by step instructions for this installation is covered in the Mechanics handbook Vol 2. Steel Fender Well for the side mount spare tyre on the 1930-31 cars. these are the wells that require welding to the fender. Made of good heavy steel. Good step by step instructions for this installation is covered in the Mechanics handbook Vol 2. This special bolt has a square shoulder on it and is used on the side mount spare wheel plates and on the rear mount spare tyre carriers that have a square hole in them. Spare tyre stud 1928-31. Used on the rear mount spare tyre carriers where there is a blind hole or where there is not a square to accept the A-1448 bolt. Made in USA. Rear spare lock nut 1928-31. This jam nut that goes down over the spare tyre mount stud to adjust the angle of the spare. Made in USA. If you are installing a side mounted spare wheel, these are the special bolts and plug for blocking off the holes in the rear of the body where a spare was mounted. Made in USA. Tyre Band Face Plate for the 1930-31, 19" spare wheel. Steel faced plate that must be used with tyre band. This covers the sidewall of the tyre. Bare steel, paint as desired. 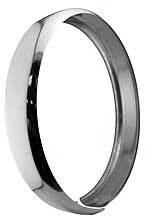 Polished stainless steel Tyre Band for the 1928-31 spare wheel. A popular accessory from back in the A' days. No additional mounting hardware is needed. Just snap around the tyre, and it holds itself to the tyre. Made in the USA. Unpolished stainless steel Tyre Band for the 1928-31 spare wheel. A popular accessory from back in the A' days. No additional mounting hardware is needed. Just snap around the tyre, and it holds itself to the tyre. Made in the USA.